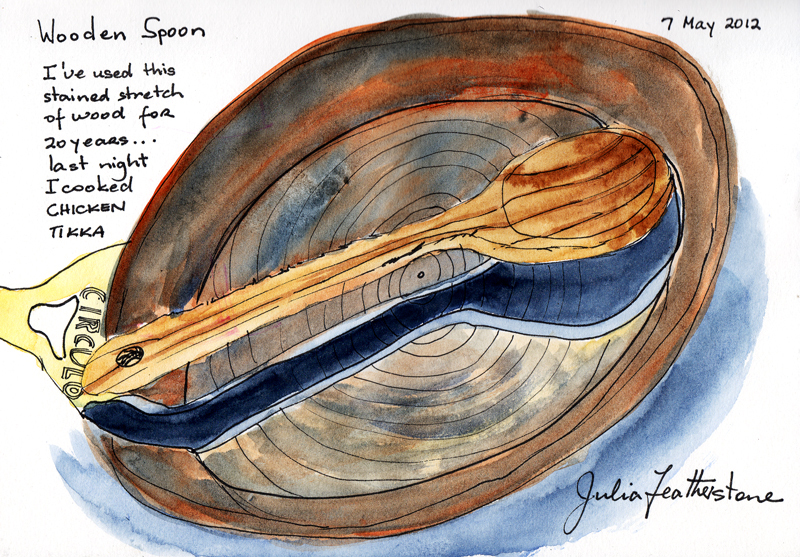 Every Day in May (EDiM) is a worldwide sketching group that draws a different subject each day in May, then uploads to Flickr and/or Facebook. I participated from 1st – 20th May, 2012. Inspiration were the high pressure sodium lights (high intensity discharge lights) that Sydney City Council installed in our street to save on electricity consumption, early in 2012, . 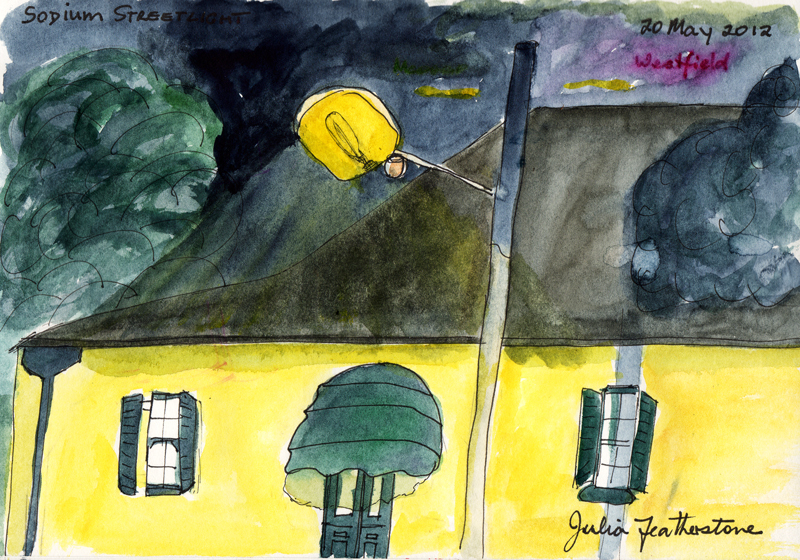 The light casts a sickly yellow over light colours, with little effect on dark areas, and minimal shadows. Recent research has shown that driver-braking under sodium lighting is 75% slower than under white light sources. Danish artist Olafur Eliasson used such lights to create a wonderful illusion of the sun. Eliasson installed 200 yellow mono-frequency lights in a semi-circle at the far end of the Tate Modern Turbine Hall for his fabulous work Weather Report 2002. The mirrored ceiling (made from mylar) reflected the sun into a circle and the reflections of its 2 million visitors. 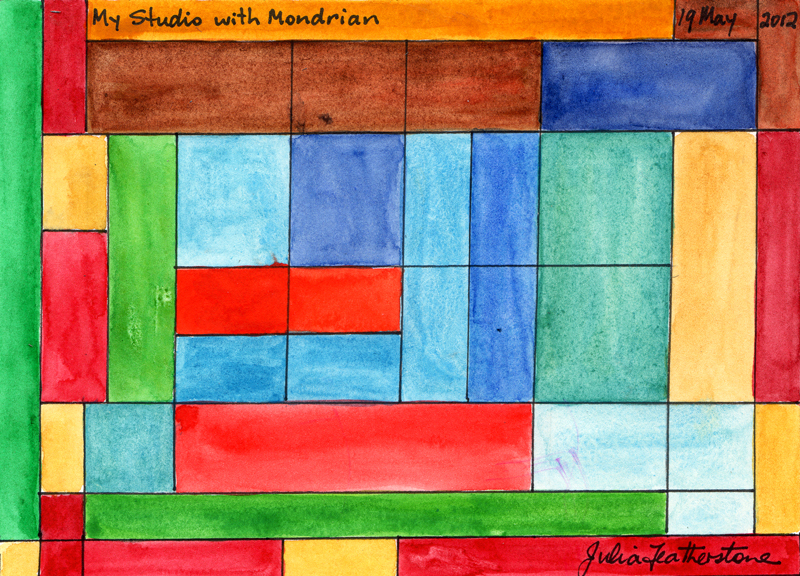 Inspired by Mondrian’s geometric paintings. 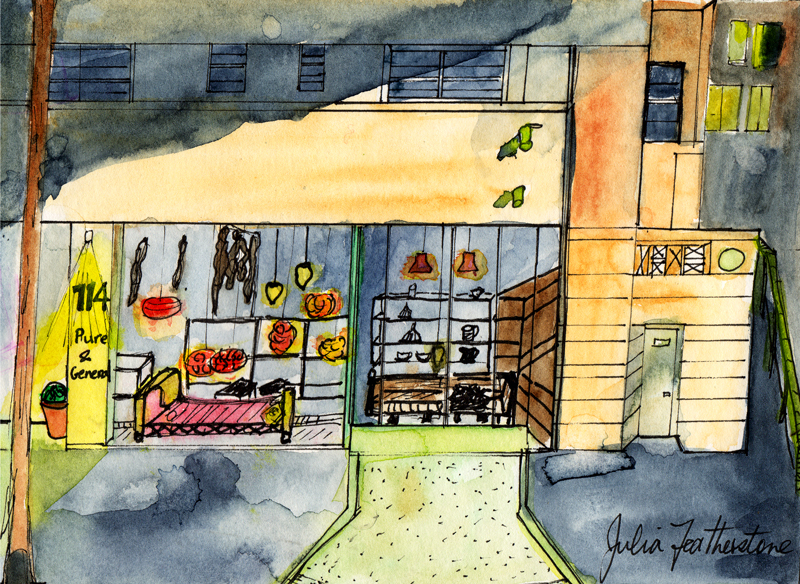 Sketch of my studio with a grid pattern of the key elements – green trees seen through the balcony glass doors , red and mango yellow painted walls, a bluish carpet, a brown wooden table with bookshelves, a green glass table, a red chair and rug, and an aqua dustcover over my keyboard. 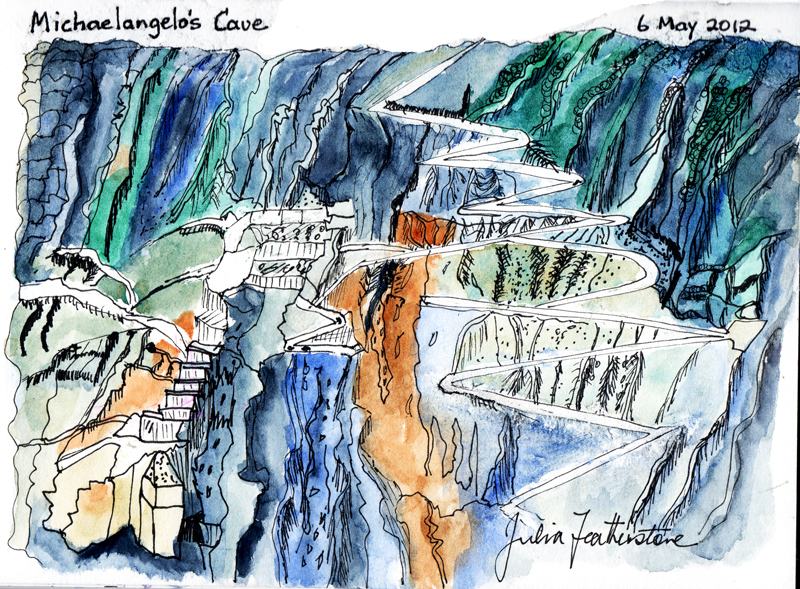 Inspired by water cascading down the glass entrance wall of Australia’s oldest art gallery, National Gallery of Victoria. Anthony Gormley’s prototypes for sculptures are installed in front of the glass. Green and light-yellow bushes are seen hear the driveway outside. Gormley’s final 51 black steel sculptures are installed across 10 square kilometres of Lake Ballard, a white salt lake, 55 km west of Menzies, WA. 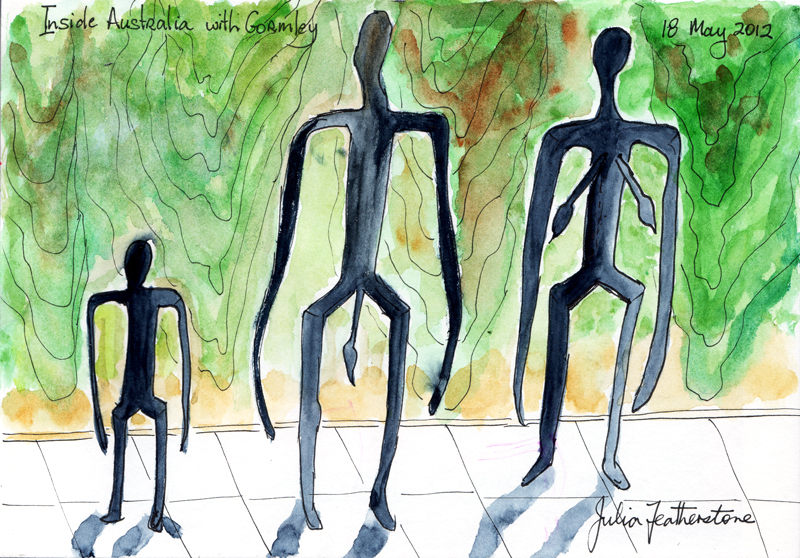 Gormley scanned the bodies of residents, then reduced their size proportionately. Gormley wanted to find the human equivalent for the geology of the salt lakes. 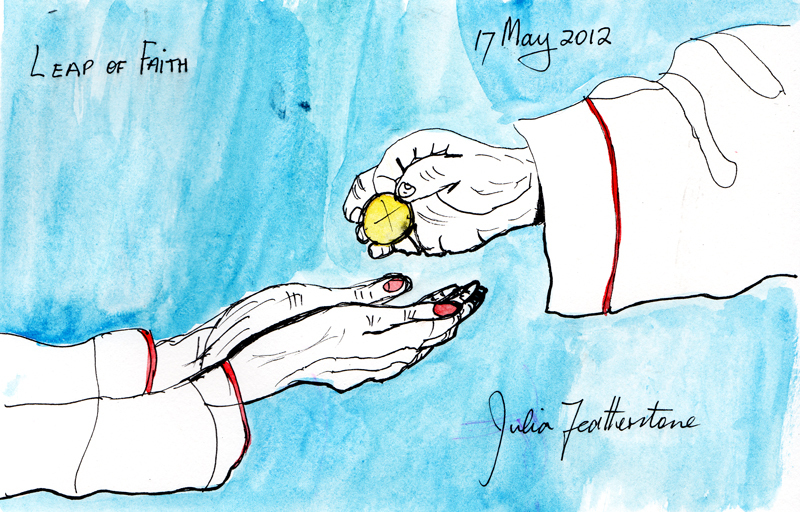 This church ritual was a leap of faith – when an Anglican Minister muttered “take eat, this is my body which was given for you” during communion ceremonies. I was confirmed when 12 years old and soon substituted surf board riding for Sunday School. 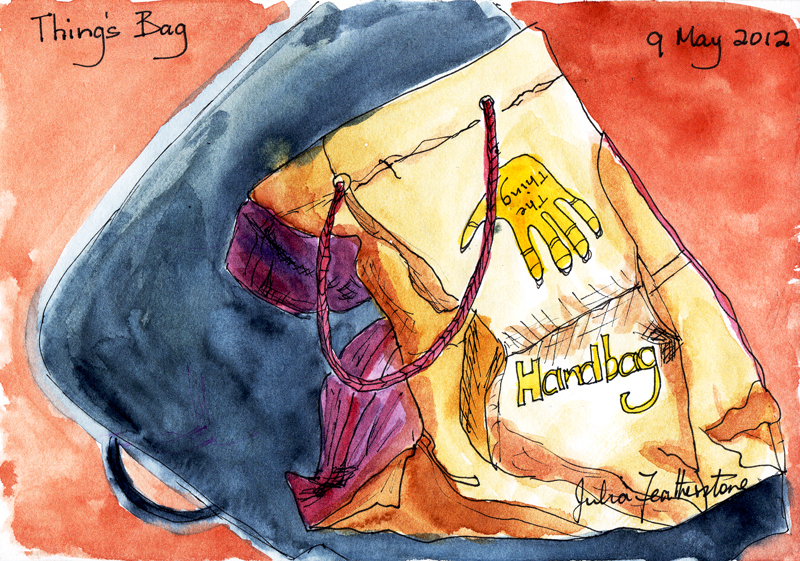 Inspired by my local shop filled with quirky goodies for the home, opened in the renovated garage of a block of flats, 2010. Before that, the garage was a bottle shop for 30 years. Our yellow sodium streetlights paint an eerie colour cast. 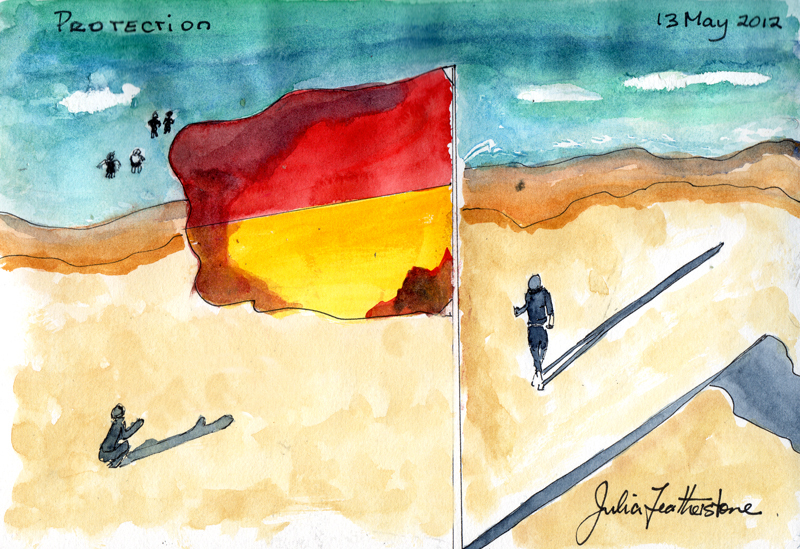 Inspired by the disappearing perspective lines of the straight Nullabor Highway that shrink to a vanishing point. 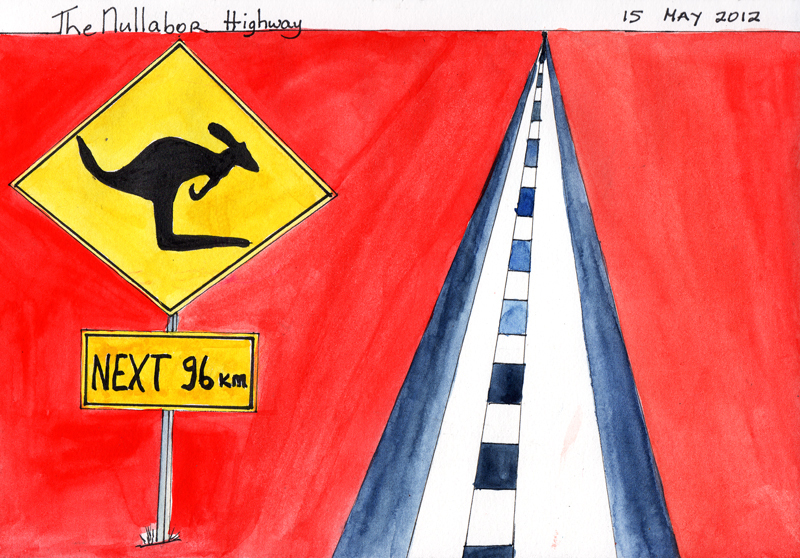 At night, headlights attract kangaroos with deadly results to both man and animal. Inspired by Manet’s Dejeuner sur L’Herbe (Luncheon on the Grass), 1863. I placed my lunch of salad and bananas in a basket for the picnicking ghosts on the grass at Mrs Macquarie’s Chair, Sydney. Mother’s Day 2012. I always surf with my two children, however, today, the wind blew from the south-west, flattening and smoothing the waves. The red and yellow flag denotes surf lifesaver protection for swimmers. Inspiration is the pattern for the Cetus Constellation. I chose 8 buttons from my mother’s old button jar collection that included a small fish and black heart! I kept the actual circumferences of the small buttons, making any detailed design tricky. The Cetus Constellation lies in the region of the sky called Water which is home to other water-related constellations, such as Pisces and Aquarius. Cetus represents the ‘whale’ sea monster from the Andromeda Greek myth where an Ethiopian princess is sacrificed to a monster to appease the gods, after angering her mother Cassiopeia’s vanity. Perseus rescued Cetus whom she married. The constellation Cetus was first charted by the Greek astronomer Ptolemy in the 2nd century. 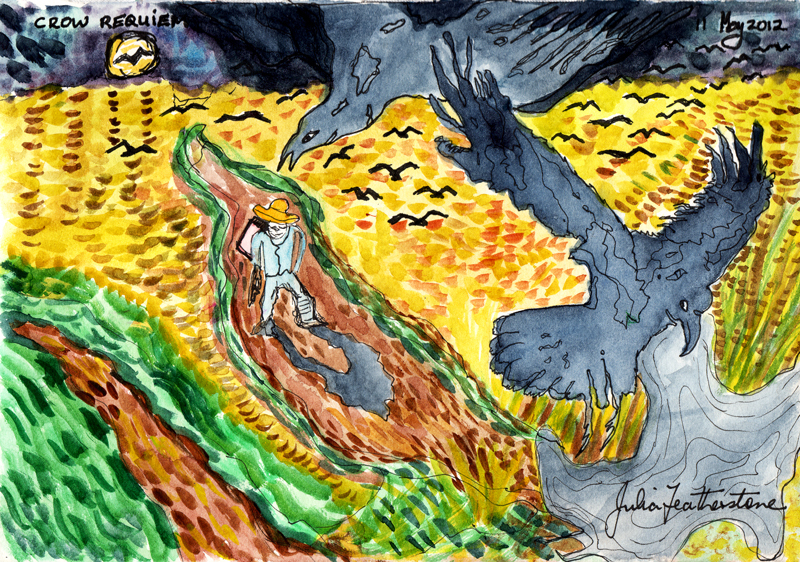 This sketch imagines another reality for Van Gogh’s death, when he shot himself in the chest in a wheat field… What if the crows he was painting had attacked him like a scene from Alfred Hitchcock’s movie The Birds, 1963? What if Van Gogh had tried to shoot the crows, stumbled and shot himself, accidentally? In death, some cultures believe that the crow comes and takes away the soul of a deceased person. Some areas call a flock of crows a massacre! This painting is an ode to Vincent Van Gogh’s final painting Wheatfield with Crows, 1890. 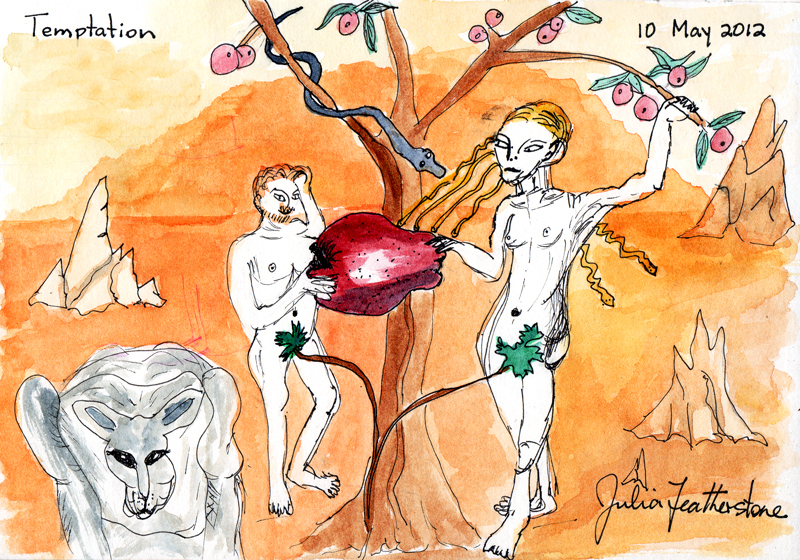 I remain amazed that after 2,000+ years, Eve is still blamed for tempting Adam to eat an apple. 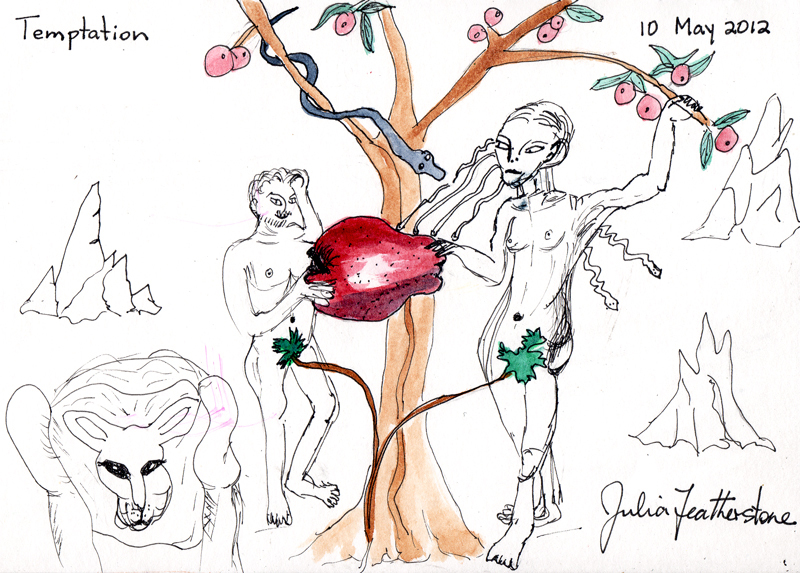 Adam could have said ‘NO, I won’t eat the forbidden apple’ and reset religious history. The scene is set in the Australian desert. I shone my desk lamp down and across the bag to create a large, ominous shadow to imagine a hand bag for Thing of The Addams Family. Shadows of Darkness crept over the reflections falling on the eggs. 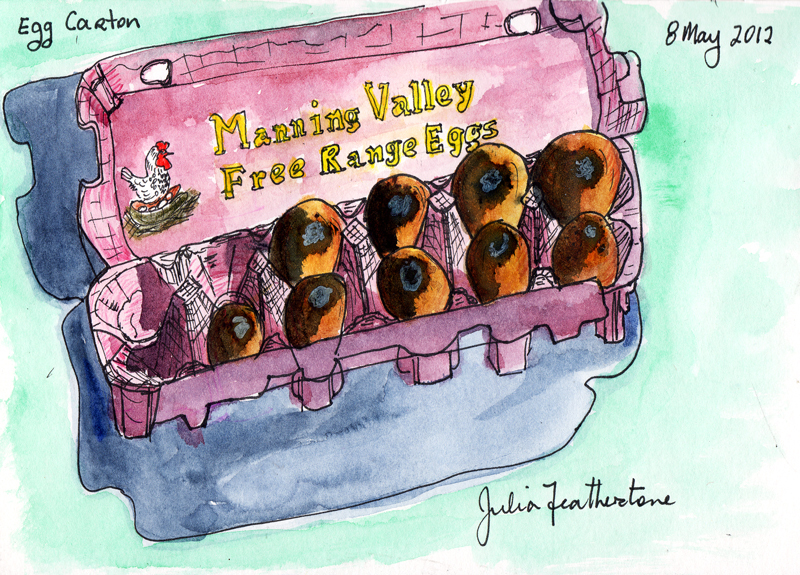 aim was to imagine Free Range Eggs from the Addams Family. 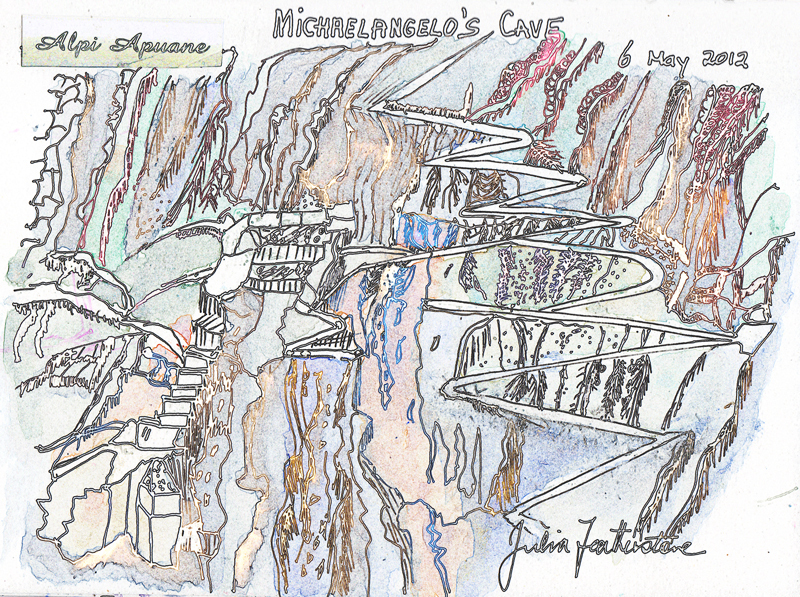 Sculptor friend Lea Ferris sent a postcard from Italy of the white marble quarry in the Apuan Alps, near Pietra Santa, Tuscany, where Michaelangelo’s marble for his life-sized David (1501-04) was mined. I love the textures and zigzag steep slopes of the road… of memory of place. The bottom image was created using Photoshop > Filters > Stylise > Find Edges. 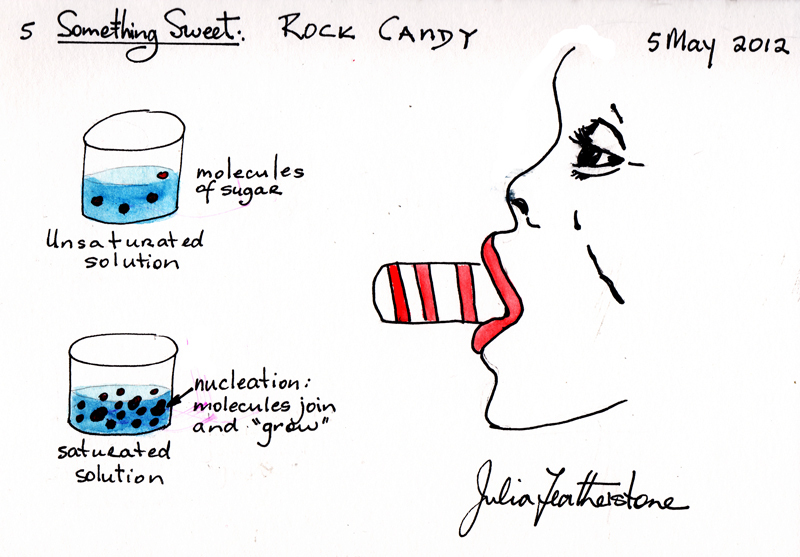 I found ‘nucleation’ a sweet idea – whereby molecules of sugar collide and join together to make rock candy. 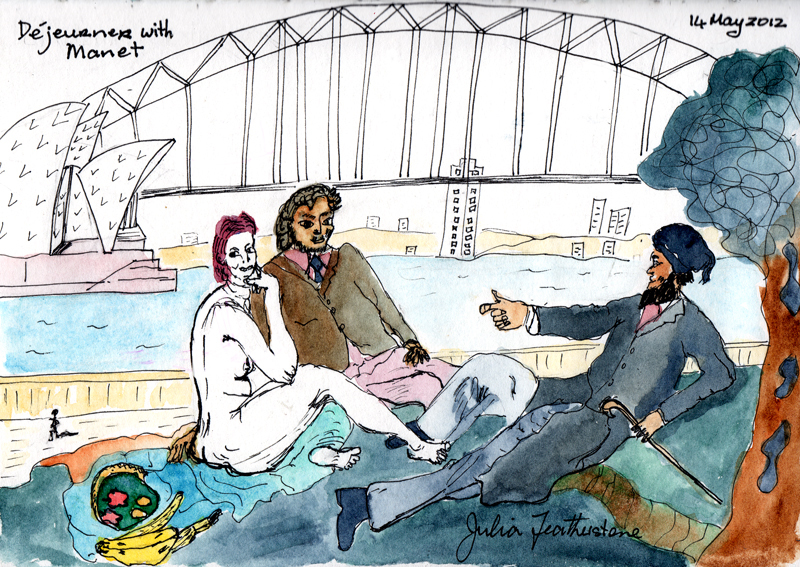 This sketch pays homage to AGNSW for bringing works from the Picasso Gallery in Paris to Sydney, while that gallery was being renovated. My guitar is special because it allows me to write songs and play music. I loved Elizabeth Abraham’s New Year’s Resolution for a year of LIGHT. I remembered that MUSIC was my word for 2012 – especially lyrics, invisible electro-magnetic waves and colour. Thanks Elizabeth! 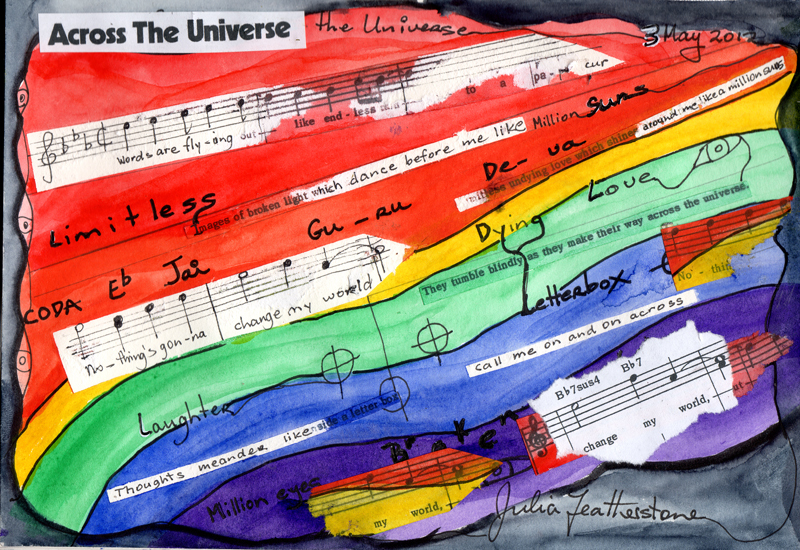 I listened to John Lennon singing Across the Universe as I tried to respond to the music and lyrics within the electromagnetic waves… I found it poignant that he kept repeating ‘Nothing’s gonna change my world’ and tragically, an assassin did change his world. This inspired me to rip and tear lyrics from the song to distort memories and hope. Inspiration was to complete old ideas. 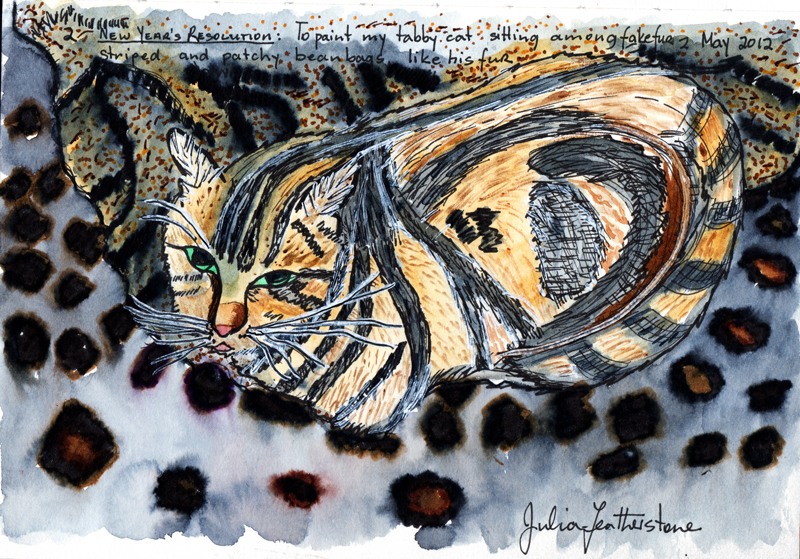 For ages, I’ve wanted to sketch this chameleon blend of fur and fabrics where my cats sleep on blankets that echo the patterns, texture and colours blend of their fur. 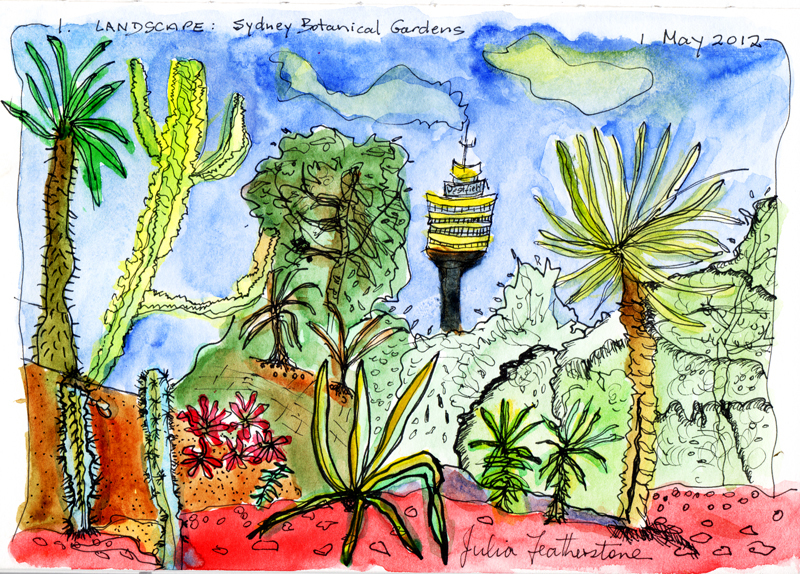 Inspired by the unexpected juxtaposition of the desert cactus garden of Mexico with Sydney’s iconic Centrepoint Tower skyline. 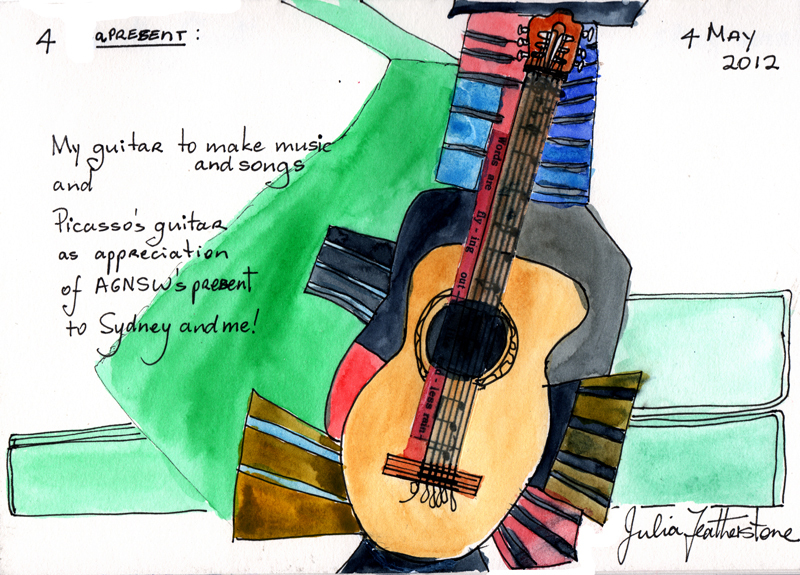 Sketched in the Sydney Royal Botanical Gardens.